You can use our Amazon lister to list your products on any Amazon marketplace worldwide. We will use your product barcode (EAN, UPC) to find a matching product on Amazon and make it for sale against that existing listing, if we find no matching barcode then we will create a brand new listing on Amazon for your product. You create Amazon profiles in Veeqo, which we use to match Veeqo product properties and values to Amazon ones. Your products will need a barcode entered in the product details or if it's a product already being sold on Amazon then you will need to enter it's ASIN instead. If you are selling products that you manufacture yourself, apply for barcode exemption at Amazon Here first. 1. Go to the Amazon listing tool by going to Products>Listings. 3. Next to the product you want to publish on Amazon, choose an Amazon Profile to use or Create A New One. 4. 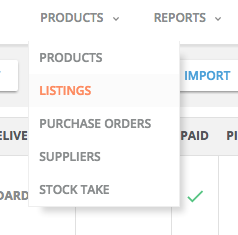 If you're happy to publish the product you can then click Publish Listing via the green tick symbol on the right. 6. After you click Publish, Veeqo will now try and upload your product to your Amazon seller central. This can take up to 15 minutes and this listing will move from the Not Listed tab to the Uploading tab. If Amazon rejects the upload then it will show in the Failed tab with the reason. Uploading can take longer than 15 minutes if Amazon have a high number of new uploads at the time.